I love Jerry Vanderstelt’s work, but I think that 5says is being a little optimistic putting this sketch card up for £750 Earth pounds. That’s over $1250. Don’t get me wrong, it’s a great card by a well known and respected artist but that price is crazy. 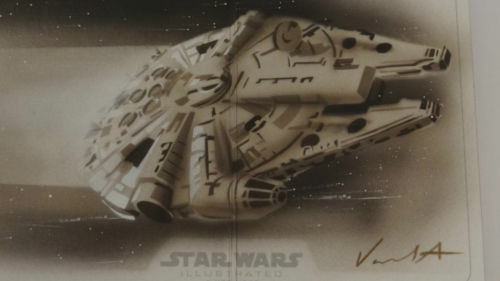 This entry was posted in Art, Things that i don't have yet..., Trading Cards and tagged Art, Jerry Vanderstelt, Millenium Falcon, Millennium Falcon, Star Wars. Bookmark the permalink.